My primary fishing buddy has gone almost all Tenkara (using the term loosely). He hipped me to a series of rods made by somebody called Goture, listed on Amazon as carp rods. He got the 24 foot model and was initially enthusiastic. I decided to be a little less ambitious and go with 18 feet. For about $40 bucks I thought it worth the gamble. It arrived today, with extra sections for the top three. I stuck a 16 foot furled line on it, with about four feet of tipper, and a size 8 wooly, for the initial test drive in the driveway. It's long, and it's stiff, and it's heavy...and it turns the biggish fly over, no sweat. I will test it for real this evening on a lake. Will advise. You are going to have a blast with carp on it! 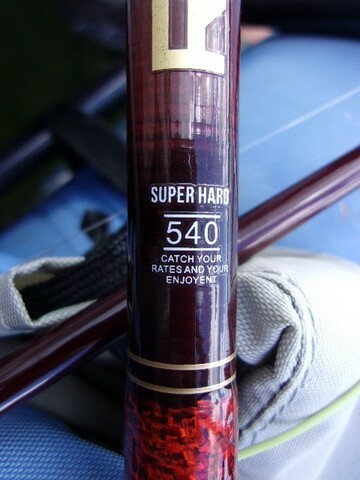 I have a similar sized rod from another chinese company. 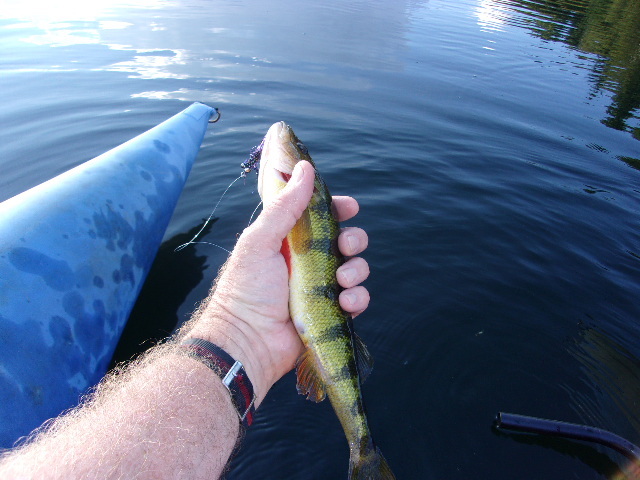 I broke it in yesterday, catching a perch, bluegill, largemouth and pickerel, in that order. Pros: The extra length is handy, no question. 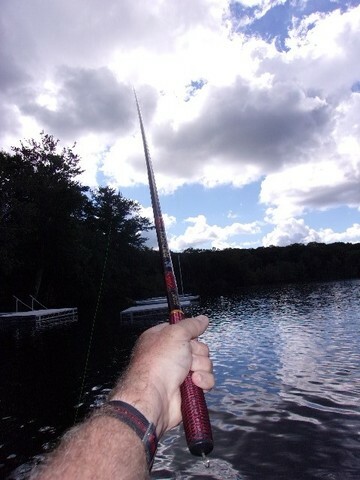 The rod is sensitive to strikes and bumps. 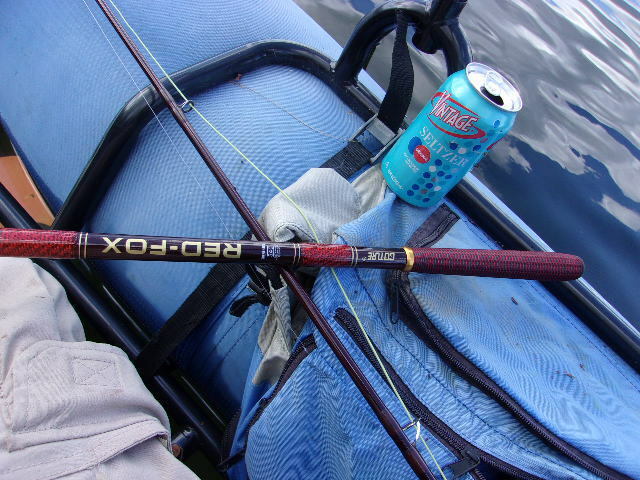 It handles heavy flies and larger fish. Cons: It's heavy. I found myself either choking up on it, a la baseball bat, or casting with two hands. Collapsed the 18 foot rod is 24 inches, long for a day pack. The rod stretches out to infinity. The handle features a cryptic bit of text. Here's the killer perch that was the first thing caught on the rod. Look at the teeth on that thing. It'll tear you apart soon as look at you. Terrifying. And a look at the handle. Cork would make it more difficult to handle, I think. I use this chinese fixed line pole. The 3.6m version is great for trout nymphing in most rivers. I used the 2.7m version for small mountain streams. And the 5.4m version for carp. They have not broken on me yet. For carp, I use 8lb line and fight the fish very aggressively. I.e. turn the fish's head left and right as soon as it hooks up to keep it from running straight out, and use the full bend of the rod to control the fish. Another Pro: Just looked it up, and wow that is a bargain. I've paid more for a handful of flies than I will for that entire rod. Gonna give it a try - - hard to go wrong at that price. Need BamBoo Rod ID, 9 footer.